I first came across Yoga With Adriene when I moved to New York a few years ago. I remember feeling freaked out by the cultish commitment my athletic friends and new co-workers had for fancy, expensive-sounding workout classes and boutique fitness studios. As someone who had never done a pull-up in my life, I couldn’t imagine having the time, money, or overall athletic skill to have that kind of routine. So, I signed up for a $30-a-month budget gym around the corner, but even there, I was too intimidated to use anything but the most accessible-looking treadmill. That’s why, when I was mindlessly searching on YouTube one day, it was so alluring to think about trying this whole yoga thing from the safety of my 7×10 bedroom. The instructor, Adriene Mishler, had a Leighton Meester-like grin and calming, ASMR-y voice that sometimes delightfully lapsed into a Texan twang when she went off-script. She was a welcome contrast to kind-of-intense workout personalities, like Jillian Michaels, who I thought were the norm. 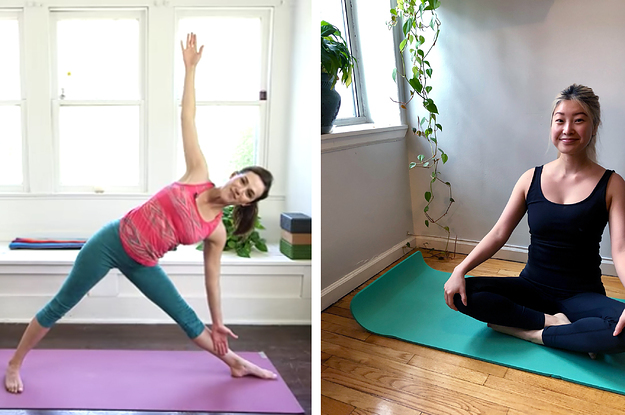 At the risk of sounding too “hippy-dippy,” as Adriene would call it, doing these YouTube yoga videos over the years has disarmed some deeply-held anxieties I’d always attached to working out — and to reckoning with my body in general. Doing yoga videos when I was getting over that awful flu, for example, helped to remind me that, hey, my body was still pretty cool and strong, even when I felt weak. There was something therapeutic in how Adriene coached me from my laptop screen to “notice my bones” and “breathe into my lower back space” and stop and marvel at the way my wrists worked. Next Forget IT — this guy obviously belongs in sales!